Today's suspected Galaxy SIII leak caused quite a stir in the Android community, of course sparking concerns over validity, likelihood that Samsung would choose such a form factor for the upcoming flagship, and just when we may see the real thing up close. A great summary of the leak on Reddit, and the subsequent comment thread got me thinking, though: just how likely is it that the leak is real? In short the answer is a resounding "not very." At first blush, the leak seems convincing - for starters, the shot in question has all the moire-patterning of a digital photo hurriedly snapped of a computer monitor, implying that whoever leaked the image didn't have time to save the file and risk being caught. This alone gives the feel of a "leak," or something we aren't supposed to see yet. Of course, anyone looking to generate a little buzz with a false leak could easily think of this angle. Next, we've got the Weber Shandwick logo in the corner. It's a known fact that WS has worked with Samsung in the past, launching various products both in America and abroad. It wouldn't be surprising to see WS helping launch the SIII, since we have already heard tell that Samsung is aiming for an international debut following the device's official announcement. While there's no real way of disproving that WS will be working with Samsung on the SIII launch, it is clear that the logo used in the above image is readily available online and therefore pretty easy to slap on to any image. Next is what we see on the leaked device's display. The calendar widget clearly mirrors the one found on the Galaxy S II prior to its launch at MWC last year, repeating its message word for word, only changing the date. Further, the display seems to carry a 720p or higher resolution (following recent rumors), judging by the teeny tiny status bar and the bottom dock which carries 5 icons, just like the Galaxy Note. It's also worth noting however, that the notification bar has a blue color scheme, while the Galaxy SII's Ice Cream Sandwich ROM features a green/white scheme. 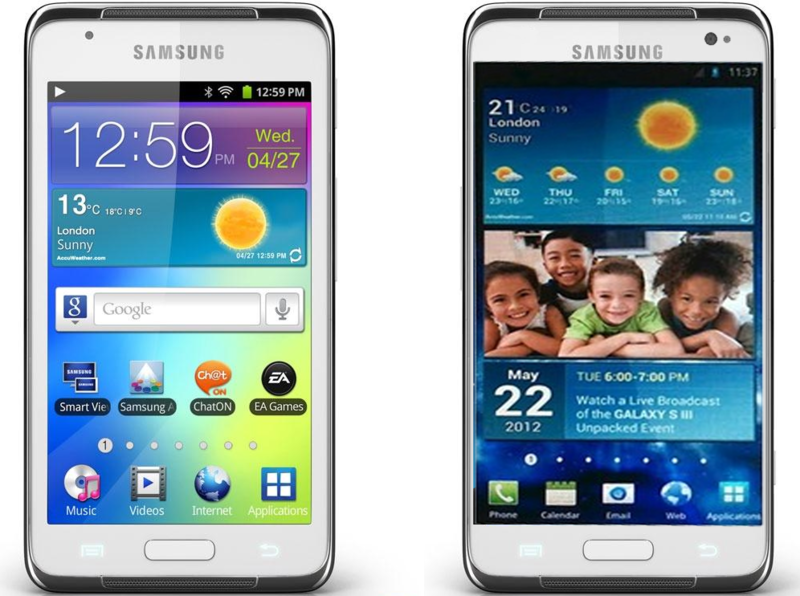 It's possible that Samsung has whipped up a new TouchWiz overlay for the SIII, but not very likely. The first thing that really jumped out to me as strange, however, is that the device is white. Samsung, in recent memory, has never chosen a white body for a smartphone (or tablet) debut. This wouldn't be a totally surprising choice, but advertising a white device before launch doesn't exactly fit historically with Samsung's strategy. Next, the device still features a hard button and two capacitive keys. Of course, rejecting ICS' baked-in soft buttons for capacitive/hardware ones isn't that radical – after all, HTC's new One line features three capacitive keys on each device. Still, given that Sammy's Galaxy Nexus opted for soft keys, I'd be surprised to see its latest flagship return to a hardware home button. Putting aside the white body and hard/capacitive keys for a moment, there's one major issue that could disprove the leak's validity - its form factor. 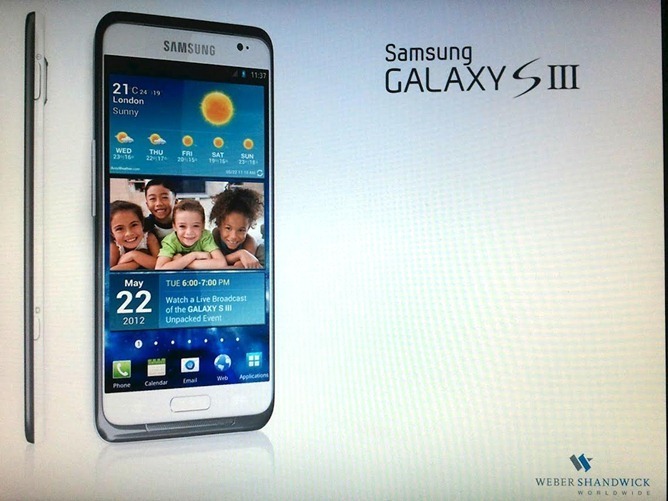 The overall form of the supposed Galaxy SIII may look familiar to some viewers, and rightfully so. The Galaxy Tab 10.1n and Galaxy Tab 2 10.1 both share a sort of super-bezel with embedded stereo speakers, but so does one other device – the Galaxy Player 4.2. In fact, the pictured device and the Player 4.2 look so similar that I decided to fire up Photoshop and throw together a mockup of the leaked device by altering a press shot of the Galaxy Player 4.2. There are precisely three differences between the Galaxy Player 4.2 press shot and my ~5 minute rendition of the leaked Galaxy SIII – the addition of a front-facing camera and proximity sensor to the right hand side of the device, the addition of a dedicated camera button, and the addition of a larger display with a crazy-thin bezel (lifted from the leaked image). Overall, things aren't looking too good for today's leak. This isn't incredibly surprising news, however, since leaked images are often unreliable or just flat out fake. That being said, it may just be possible that Samsung has decided to go with the exact form factor of the Player 4.2 for its new flagship smartphone. It just isn't very likely.